Superior Design - uses modular filters where the filter element and the filter housing are all-in-one assembly for quick and easy annual filter changes. Just unplug and go, no wrenches necessary! Also, no permanent canister filter housings that can weaken and burst with age. Advanced long lasting filters – 2,500 gallons or 1 year between filter changes. 130 gallon per day water production. The advanced redox media alloys found in the IRON filter chemically changes soluble ferrous cations (clear, dissolved iron) into insoluble ferric hydroxide, which is then trapped in the IRON filter’s sediment filtration layer. This prevents dissolved iron from fouling the reverse osmosis membrane, and permits the use of this system with iron rich well water. The HydroGardener® Pro Advanced Remineralizing Reverse Osmosis system for hydroponics and gardening delivers pH Balanced Mineral Water on Tap by first stripping the water clean, removing 98% of contaminants using the reverse osmosis (RO) process, sediment, iron and catalytic carbon filtration then channels the water through the advanced remineralization system to add (15-30 ppm) calcium and magnesium minerals. The HydroGardener® creates the best possible water for your plants and garden. The HydroGardener® Pro solves many of the problems associated with traditional RO systems. Traditional RO systems are destroyed by well water that is high in iron and manganese. The HydroGardener Pro contains an iron prefilter with KDF85 media and catalytic carbon to remove iron, manganese and hydrogen sulfide which would otherwise destroy the RO membrane. This filter also remove the stubborn chemical disinfectant chloramine. HydroGardener® systems use larger fittings and tubing than Traditional RO systems to double the water flow rate. Traditional RO systems produce water that is demineralized and slightly acidic. The advanced Tap Master™ Artesian HydroGardener® Pro remineralizes the water, adding a small amount of cal/mag minerals (15-30 mg/l) because it's easier to acid down than cal/mag up. Traditional RO systems suffer from poor water production and high water waste in the low water pressure environment accompanying most well water systems. 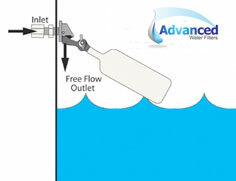 In designing the HydroGardener® Pro a sophisticated combination of flow restriction components, including a non-electric permeate pump were integrated into the system architecture to regulate pressure in the high efficiency 130 gpd membrane chamber for optimized purification and minimized wastewater production. Only the most sophisticated components certified to NSF standards are included in the design and construction of our product. One thing you will notice about the HydroGardener® is that our filters are incorporated into the filter housing, so that when it comes time for the annual filter change, the filter, and the entire filter housing, are disposed of. This is to reduce the possibility of leaks under your sink. The leading competitors “canister” type RO system keeps the same filter housing year after year, subjecting it to constant high water pressure, water erosion, and wear from maintenance. Only the filter element is changed. After about 5 years the walls and seals of the competitors canister filter housing can begin to weaken and decay, eventually failing, potentially causing serious water damage to your home or business. Dimensions: Purification unit - Pro model: 15” high x 15” wide x 5” thick -- Connect to your storage tank, irrigation system or hydroponics vessel with the available float valve. In the Box: Fully assembled purification unit, filters included, 3/8-Inch feed water adapter with shut off, garden hose adapter, 150 gpd tfc RO membrane, drain saddle, instructions. 5 year limited warranty. MADE IN THE USA. Click the button below to add the HydroGardener Pro Remineralizing Reverse Osmosis System to your wish list.